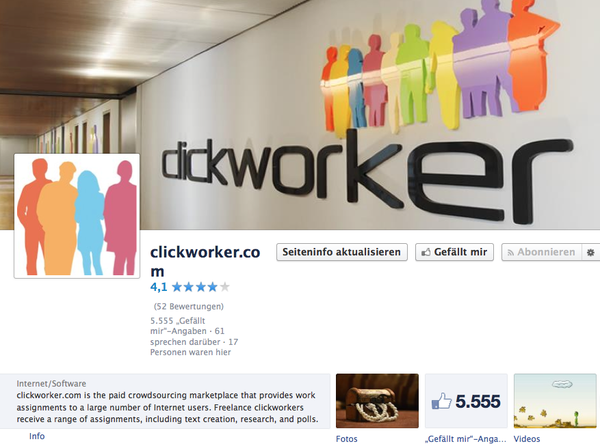 Blog > 5555 likes for our Facebook Fanpage – Looking for a New Look! Do you have creative talents and would you like to help us to jazz up our aging profile image? That would be great! Why not take part in our contest and design our new Facebook Profile Picture? The three Clickworkers whose images are most voted will receive cash prizes. The winner will receive 50€ and prizes of 30€ and 20€ are waiting for the Second and Third places. We need the corresponding image files in .jpg, .gif or .png format. The motto can be anything, but it should be suitable for clickworker. Dieser Artikel wurde am 26.May 2014 von mandy geschrieben. Great! We are curious about your picture! The icon should be the company logo with a mouse arrow clicked on it. Do you wish only the profile picture? Or do you also WANT the cover image of facebook? We are only looking for the profile picture. Hallo und herzlichen Glückwunsch zu 5555 “likes”! ….stellen wir die Bilder für Euch (nicht “auch”)…. Hoffe, ich bin keinem “auf den Schlips getreten”, sondern konnte helfen. Allen Teilnehmern viel Erfolg! wieso finde ich denn jetzt immer noch die selben Fehler in obigem Text? das ist in der Tat seltsam. Könntest du beim Betrachten des Blogartikels eventuell kurz F5 drücken? Das sollte die Seite aktualisieren. Shouldn’t the contest be closed by now? Dear Nerea, yes the contest is closed and we are happy to announce the winner on facebook.